Newly-released testing data from NC’s Department of Public Instruction (NCDPI) reveal that NC’s public charter school students academically outperform peers in traditional public schools in 12 of 13 demographic categories. The previously-unreported data were released just in time for National Charter Schools Week. Nationally, there are nearly 7,000 charter schools serving more than 2.6 million students. In North Carolina, NCDPI projects that more than 150 public charter schools will serve more than 100,000 public students in the upcoming school year. This new data release separates out the performance of public charter students from that of traditional public students and is the first of its kind for NCDPI. In 12 of 13 demographic subgroups— including minorities, economically disadvantaged students, and students with disabilities— students at public charter schools academically outperformed students at traditional public schools on standardized and state-mandated End-of-Grade (EOG) tests. Overall for the most recent year, NCDPI data reveal that the performance average of NC charter school students was 66.6% compared to the traditional public school student performance average of 56.2%. As seen in the chart below, the data reveal that the EOG performance average of Hispanic students in public charter schools is 58.6% compared to 44.9% in traditional public schools. For black students, the charter average is 46.8% compared to the traditional public school average of 37%. The charter average for students with disabilities is 30.9% compared to the traditional public school average of 20.6%. Economically disadvantaged students also performed better in public charter schools, at a rate of 49.9% compared to 41.5% in traditional public schools. These percentages—called composites—represent the number of EOG tests passed by all tested students (grades 3-8) in all subjects. Traditional public schools outperformed public charter schools in only one category—“Academically Intellectually Gifted”—by one-half of a percentage point, achieving 96.0% compared to public charter performance of 95.5%. Public charter schools are public, tuition-free schools that have open enrollment, which means that any student may choose to attend, regardless of ability, income, or achievement level. Public charter schools may offer unique curricula or educational programs other than the state-mandated curriculum, which in NC, is Common Core. Though they can select alternative curricula, public charter schools must take the same Common Core-aligned EOG tests as do traditional public schools. Public charter schools provide parents with tuition-free choices for where, and how, their child is educated. NCDPI testing data now conclusively confirm that NC’s public charter school system is indeed a success to be celebrated during National Charter Schools Week. 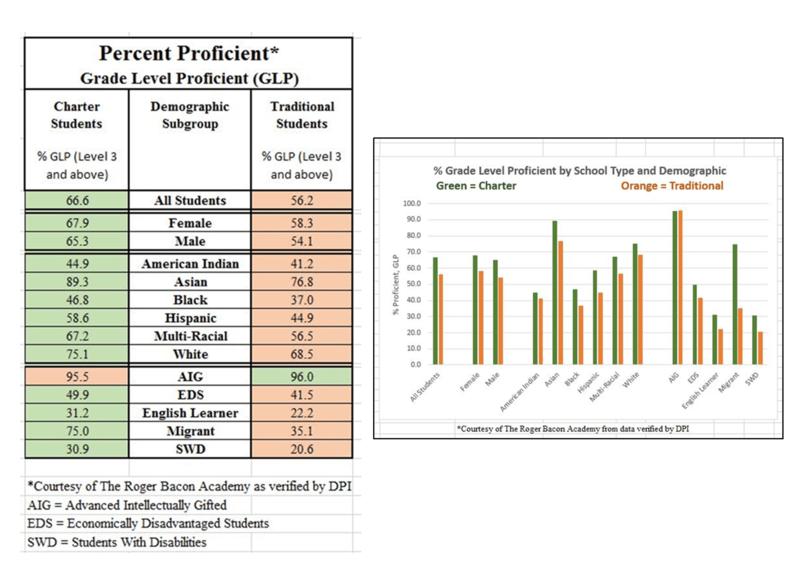 In addition to NC public charter school students producing a state academic performance average that is more than 10 percentage points higher than that of NC traditional public school students, the data presented below demonstrate that 12 of 13 student groups have more academic success at NC public charter schools than do their peers at traditional public schools. The promise of improved outcomes at NC public charter schools is made even sweeter by the fact that public charter schools are tuition-free, welcome all students, and provide significant savings to taxpayers. A public education system that improves academic outcomes for 12 of 13 student groups for less taxpayer cost should be desired, celebrated, and helped to flourish. Data and calculations represented in these charts provided by NCDPI. Charts assembled by the Quality Control Department of The Roger Bacon Academy, Inc. at the request of The NC Alliance for Public Charter Schools.